What I would like to speak about in Althusser is his political mobilization of Bachelard’s ‘epistemological break’ (a notion that, as an aside, belongs to an already-politically-charged historiography of science). Althusser transforms it into the principal instrument of an historical materialism: The scientificity of the latter – the actually-existing sciences standing for a Science to come – will consist in perpetually seeking points of rupture with the ideological ‘givens’ that constitute at once the raw materials which it must work, and ‘epistemological obstacles’ strewn in its path. The key terms of this discourse are rupture and cut (from Bachelard) or line of demarcation; production and taking a position (prise de position) (from Marx). The engaged prise de position that will sharpen the ‘scientificity of science’ will consist in rupturing with the representation of science, by differentiating what is given with a cut, this cutting being itself a productive gesture that materializes the rupture in a clear formal line of demarcation. Science is the production of cuts, and cutting is production. The excision of the ‘scientificity of science’ from the thickets of its self-representation will be the productive task of philosophy. Althusser qualified the ‘unconscious’ and ‘spontaneous’ nature of such self-representation, and advanced a programme for its correction, under the rubric of a course of ‘philosophical initiation’, later published as ‘Philosophy and the Spontaneous Philosophy of the scientists’. I will suggest that the ‘non-philosophical’ initiation to which Laruelle invites us at once extends and radically breaks with this programme. It was in 1967 that Althusser launched his ‘Philosophy Course for Scientists’, whose aim was to wrest philosophy from its academic confinement and to make it accessible to ‘the masses’ through an ‘initiation’. The aim of this initiation was to induce the audience firstly to recognize their own unconscious implication in philosophy – everyone philosophises, not just philosophers, and philosophy qua circumscribed academic discipline only reinforces our ignorance of this ubiquity; and secondly, to draw a ‘line of demarcation’ between this ‘spontaneous philosophy’ and the taking up of a properly philosophical position – a prise de position – that would enable one to become vigilant against this ‘spontaneous’ ideological grip. Althusser aimed to reveal to his audience of scientists and would-be scientists that they were always already implicated in philosophy despite themselves: Scientists obscure the productive reality of their practice by ‘spontaneously’ producing philosophical interpretations of their practice and its results – with the all-important qualification that this ‘spontaneity’ is only (in Althusser’s words) ‘spontaneous because it is not’; the apparent immediacy of its artefacts belongs precisely to that most odious of ideological illusions, ‘the illusion of the “natural”’. Ultimately the spontaneity of scientists’ own representation of their practice ‘dissimulates [the] contradictions’ of the social ideological apparatus which in reality govern its apparently spontaneous terms: ‘what seems to pass before them in reality passes, in what is essential, behind their back’. We are always already within philosophy, qua subjects of social forces which cut up and demarcate the world in a way which precedes us and appears to us ‘spontaneous’. But Althusser now proposes that philosophy proper, as distinct from what we might call ‘pre-philosophical philosophy’ – is able to ‘trace lines of demarcation within the fact of tracing lines of demarcation’. Philosophical Initiation invites scientists to recognize the forces at work behind the pseudo-categories with which science is represented; to take up a position by rupturing with these ideological representations; and to make cuts in the fabric of scientific ideology – (itself a body of cuts) – in order to demarcate its self-representations from its effective materiality. there is indeed something that you do not know about philosophy – it is that it is not before you as you imagine, but behind you, in that element of the always-already upon which the veil of ignorance is usually drawn. The problem is thus not that of knowing enough philosophy, but, in a very particular sense of the word ‘know’ which comprises a relation with non-knowing, of knowing it already too well, in forms whose confusion needs to be unraveled, necessitating an intervention so as to trace within them their lines of demarcation. Althusser therefore brings into relation a kind of pre-conscious or un-conscious spontaneous-philosophical ‘non-knowing’ and a new kind of properly philosophical knowledge that would withdraw the veil and reveal this ‘spontaneous’ ‘non-knowing’ for what it really is, a dissimulation of production. But this task is not straightforward, it involves a kind of impossible twisting free – Althusser insists that ‘I cannot speak of philosophy in general except on the basis of a certain position in philosophy’: ‘There is always already philosophy’, and this itself is the problem of philosophy. The ‘before’ and ‘after’ of philosophy – ‘pre-philosophical philosophy’ and ‘philosophy’ proper – are in fact the same element. Philosophy proper consists firstly in the realization that ‘there is nothing behind the curtain’, and secondly in the act of drawing lines of demarcation, in meticulously cutting through this element, itself fabricated of pre-existing cuts, rather than remaining the confused dupe of ‘spontaneity’. For Althusser, of course, what is important is the meshing of this enterprise of philosophical initiation with a historical-materialist task: The ongoing revolutionary task of ‘the cut between science and ideology’ consists in amputating ‘scientific ideology, or the ideology of scientists’ from the effective formal achievements of science; the compromised enterprise of ‘making sense’ of science’s output, from its effective materiality. And this even, or precisely because, the two are always found in de facto alloys. The cut also a refusal of the aspiration to a de-polemicised universality. To engage in philosophy proper is ‘To dissipate the fusional illusions of continuity’ of ‘the [philosophical] discourse of the universal’, ‘to have done with the attitudes of compromise which sacrifice all to the desire for unity’, and ‘to recognize the necessity of […] rupture’ in drawing ‘the full consequences of the fact that there are everywhere contradictions, tensions, struggle, conflict, and that no practice escapes them’. To summarise, Althusser’s position in two propositions: 1) A field of conflicting productive material forces is effectively at work, but is as it were congenitally and irreparably prone to a confused and false auto-representation (ideology is, as it were, ontological, since ‘being’, whether represented in the situation of the social or in the laboratory of the scientist, is always already the locus of a ‘pre-philosophical philosophy’, a series of ‘natural’ demarcations that precede its subject). 2) It is possible to asymptotically ‘decrypt’ being, to use the cutting tools of philosophical critique to hack science out of its ideological matrix. Now, I would say that Laruelle’s non-philosophy belongs to an explosive moment in French philosophy, inspired by this initiation, and that briefly flowered before the events of ’68 forced Althusser and his associates to reconsider the programme. It is as if the invigorating excitement and the immediate exigencies presented by 68 suffocated the more potent charge of this moment, in which (I would say) thinkers such as Derrida, Badiou, Lyotard, and others participated, before diverging in various ways. It is a moment to which belong for example the two papers ‘Mark and Lack’ and ‘Infinitesimal Subversion’ which can be properly considered to constitute, along with his first book The Concept of Model, a complete episode in Badiou’s philosophical development. Following Althusser’s ‘Course’, the ideology to be dissipated in Badiou’s papers is primarily the representation of science by scientists; and for Badiou, the epistemological break or cut is consummated in formalisation and inscription. Across these articles Badiou also develops the sense in which ‘Classical philosophical reason’ exploits representation or ‘spontaneous philosophy’ by integrating it, as Althusser had said, into ‘fusional illusions of continuity […]developed […] by the discourse of the universal’. Thus in ‘Mark and Lack’ Badiou will insist that we distinguish from the formalism of Frege’s logical derivation of number Frege’s representation of that operation, as well as Miller’s psychoanalytical exploitation of that representation; and in ‘Infinitesimal Subversion’ he will demonstrate that the ‘fusional illusion of [philosophical] continuity’ characterizing Hegel’s philosophy merely exploits the attempts, within mathematics, to represent mathematical continuity, in the terms inherited from ‘classical philosophical reason’. In ‘Mark and Lack’, on the basis that production per se consists in a cutting or separation, ‘being nothing other than the effective division of the materials being operated upon’, Badiou argues that since logic deals only with inscriptions, its production mechanism can be exhibited as a kind of industrial machine whose production of a stratified structure is, so it seems, merely ‘channeled’ through the history of human scientists. In the glorious steampunk logicism of these early works, Badiou escries the scientific as a virtual machine with cutting edges, descending from elsewhere, obtruding into knowledge with the force of trauma, an automated nightmare deployed against the global illusions of philosophy. The weight of Badiou’s argument is that its operations, stratifications, pulsations and movements are radically indifferent to the self-differing movements with which philosophy – whether Hegelian or Lacanian – would try to encompass it. 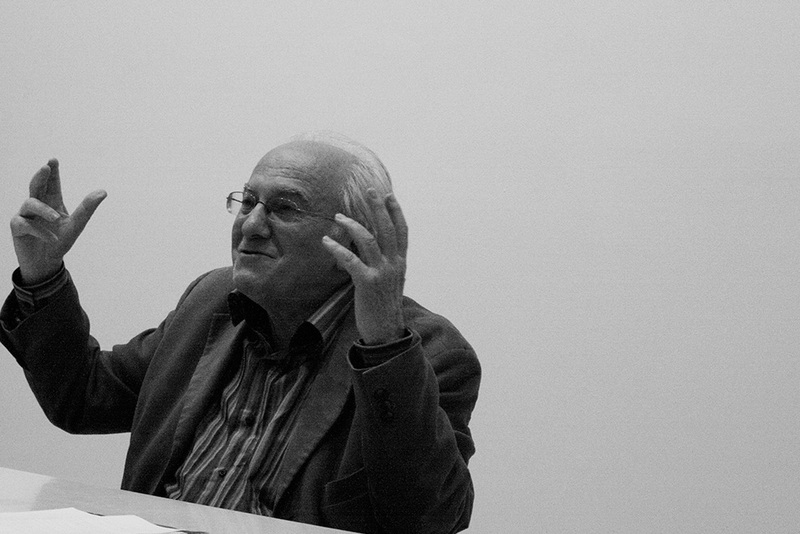 While we cannot enquire here as to how, and why, Badiou’s work changed course post-68, I would like to say that Laruelle, for his part, remains in some sense faithful both to this moment, and to what Althusser went on to call his ‘theoreticist error’ – indeed to exacerbate it. From the point of view of non-philosophy, Althusser’s repentance in this matter amounts to a capitulation – one grounded in the insufficiency of an all-too-philosophical resolution of the problem of spontaneous philosophy. And Badiou (who also submitted himself to merciless autocritique with regard to this moment) shares this renunciation and then goes on to selectively fetishise a local instance of science, namely mathematics. But what was glimpsed in this moment was science as a generic unilateral psychosis, consigning philosophy to death by a thousand cuts. Laruelle’s fidelity to this moment consists in subjecting, under the pressure of this blind force of science, even ‘philosophy proper’ to the critique of spontaneity and revealing it as, still, an impoverishedly ‘natural’ practice of decision. For Laruelle, Althusser’s struggle remains symptomatic of a spontaneous philosophy of the philosophers – the ‘oldest prejudice’. For, according to Laruelle, if philosophical production spans both spontaneous and ‘proper’ philosophy, it is not a matter of accepting one’s role in this production, so as to do one’s best to shed illusions. Instead one must refuse to cut, and denounce decision. Rather than fetishizing a particular, local, science, non-philosophy aims to follow the path indicated in this moment, distilling an essential science – clarifying the ‘scientificity of science’ far more than Badiou does. For Laruelle, the essence of science lies in this blind, deaf, flat, xeno-industrial process that proves implacably impervious to ideological, globalizing thought, so much so that it doesn’t even need to be cut out of it by philosophers! So that, rather than philosophy setting itself the task of presiding over the separation of the ‘ideological of ideology and the scientificity of science’, science impinges from without on philosophy, in the form of this psychotic, flattened or leveled thought impervious to its endless reimplications, differencings, and intrications. Once we learn to operate with the instruments of this essential science, as has been mentioned in the previous presentations, it can then take philosophy as its material. So that the task of escaping spontaneity is no longer a hopelessly twisted one. Non-philosophy declares, resoundingly, that philosophy is certainly a material to operate on, without any longer being at the same time the element in which we swim (the ‘swimming pool’ from which, as François told us, he is keen to exit). ‘Man no longer has a privileged or essential affinity with philosophy.’ – philosophical decision is a spontaneous snare for man but not constitutive of thought as such. So there is no reason, like Althusser, to accept philosophy’s status as a reflexive practice whose only object is itself, which ‘draws lines of demarcation that endlessly produce new philosophical questions.’. According to Laruelle, philosophy relies on the spontaneous ‘self evident’ fact that ‘all production consists in transforming a material while staying on the same level as it, remaining content with distending the general convertibility of the realms implicated in practice’. On the contrary, Non-philosophy aims to ‘exceed the world’. Non-philosophical initiation consists not in becoming a conscious master of decision, master of cutting, but in first of all refusing decision, in refusing to participate in production, demarcation. This is why one can qualify this initiation as ‘gnostic’, consisting in realizing – realizing – that ‘we must have “exited” from the world without first having had to enter into it in order to leave it’. (the opposite of what Althusser suggests when he says ‘I entered the necessary circle deliberately’). Undoubtedly Laruelle refuses what now appears as Althusser’s philosophicalist error; he overturns the presumptuous idea that philosophers have the authority to ‘help’ others to escape spontaneity, can instruct them, against their spontaneous presuppositions, as to what they are ‘really doing’. His vision of science and of unilaterality simplifies what had seemed a nightmarishly knotted task. And the key question, I think, in regard to non-philosophy, is how we evaluate this claim to simplification or suspension. Non-philosophy invariably appear[s] in the form of a programme or a project, one that irritates people because it never seems to be realised. But our instinctive irritation here is perhaps a product precisely of the eager demands of ‘68, demands we are now far enough removed from, and whose effects we can now see clearly enough, to evaluate anew. Althusser’s nightmare consisted in one’s finding oneself – as always happens in dreams, without knowing how one got there – held fast in a dense thicket, marked by the stigmata of its thorns, trying to find enough space to twist the blade, to cut oneself out of it … and suddenly realizing that its very fabric is entirely constituted of nothing but cuts. Non-philosophy at once intensifies and obviates this paranoiac nightmare of endless circumspection and vigilance. But now the relation between knowing and non-knowing is redistributed. Escape is no longer a matter of teasing apart cuts with cuts. It is a matter of patiently assisting this Thing from outside as it extracts us unilaterally from spontaneity and decision; in extirpating once and for all what we might call the original spontaneous philosophical illusion – that which consists in the philosopher’s belief – the ‘oldest prejudice’ – that the world of which he dreams feverishly, is reality. It is a matter of having the courage to give this thing with no unconscious, no history, no spontaneity, no reflective capacity, free rein to axiomatically dismember the world, to combust human spontaneity, to render us into Strangers. This is the true nightmare for philosophy, but it is no longer a nightmare of philosophy.